Added on October 5, 2011 by PS Cat02. We just got back from Germany and Switzerland, where we worked a lot but also ate some tasty European food. We especially liked Turkish imbiss, all the delicous breads, and we even got to try some fancy “one-day” chocolate in Zurich. (Everything in Zurich was crazy expensive - riding the bus cost around $6 (so we walked!) and a cup of coffee is also around $6+ so we had to get out of there really fast...) I saw Bunny eat several sausages. Bunny and I want to send a special thank you to Henrike Plegge at ZKM for organizing the workshops and all her hard work in making sure our trip to Germany was comfortable, work-efficient, and fun. We learned a lot from everybody we met, especially Uta, Peter, & Ella who let us stay at their apartment the whole time and told us so many wonderful stories that we will never forget. Thank you. Bunny in front of the ZKM, on her way to the Karlsruhe Zoo. Ella next to the bread slicing machine. 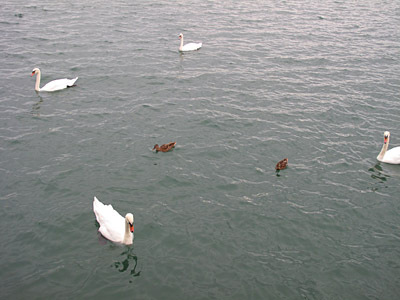 Swans and ducks floating on Lake Zurich. walking in the woods on the banks of the Rhine river near Karlsruhe.